Kerry Phippen is originally from Perthshire but has lived in the Stroud valleys for several years. 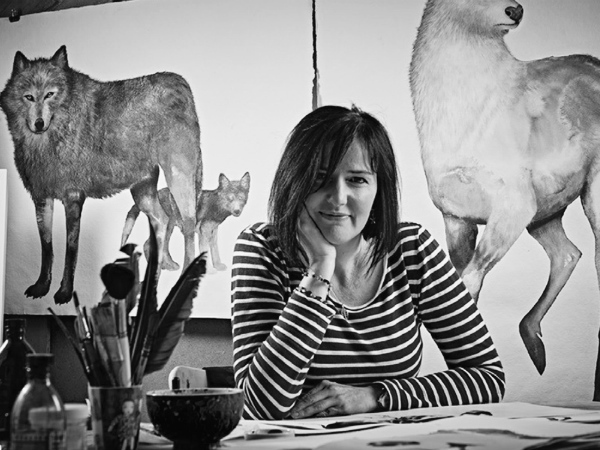 Kerry takes her inspiration from the ancient connection between man and beast as well as a love of remote landscapes and nature. Her own drawings and paintings range from large scale intricate and detailed acrylic paintings on domestic wallpapers to more delicate and gentle ink paintings on handmade cotton papers. Kerry has received several awards in many prestigous venues in the UK and has exhibited in The Royal Academy, Royal Scottish Academy, RWA , and The Jerwood Drawing Space. She has an ink drawing 'Ghoul School' in the permanent collection of The British Museum. Her style of teaching is very relaxed and fun, and always encourages students to develop their own style with confidence and technical know-how. She lives in Stroud and paints and draws in her studio overlooking the Slad Valley.